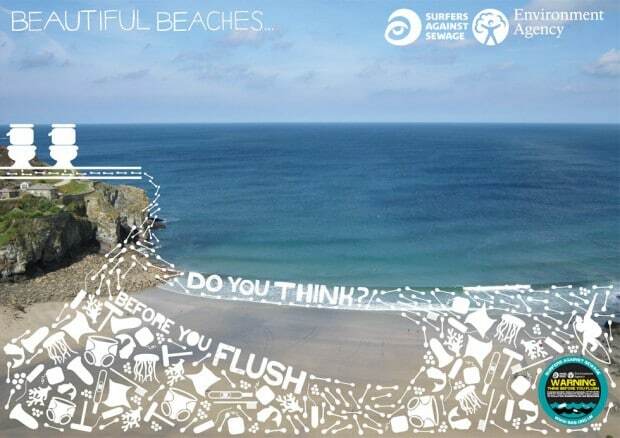 SAS celebrates Porthleven as the world’s first Think Before You Flush town! Think Before You Flush (TBYF) is an award-winning SAS initiative which raises public awareness about the problem that sanitary products (known in the business as Sewage Related Debris or SRD) cause in the sewage system and subsequently the marine environment when flushed down the toilet. SAS is proud to announce Porthleven as the World’s first Think Before You Flush Town. Working closely with the Environment Agency, SAS successfully engaged the Porthleven community with the Think Before You Flush (TBYF) campaign, empowering them protect local beaches from unwanted sewage discharges and sanitary waste. Porthleven won the accolade as the country’s first TBYF Town with over 65 local businesses participating in the initiative by displaying TBYF posters, stickers and information leaflets prominently in their premises. The initiative received the backing from Porthleven Town council, Keep Britain Tidy, Visit Cornwall and Cornwall Council, and with the support of County Hall, TBYF material will be displayed in public conveniences throughout Cornwall. As part of the programme, SAS also delivered an entertaining and engaging presentation on TBYF at Porthleven School to raise awareness amongst local students. Ultimately, SAS hopes that the TBYF Town model will be replicated across the South West and then nationally, helping keep more beautiful beaches free of sanitary waste. Environment Agency, Environmental Monitoring Team Leader, Claudine Fontier says: “The majority of sewers in England and Wales are “combined sewers” and carry both sewage and surface water from roofs and drains. A storm overflow operates during heavy rainfall when the sewerage system becomes overwhelmed by the amount of surface water. The overflow prevents sewage from backing up pipes and flooding properties and gardens. An emergency overflow will only operate infrequently, for example due to pump failure or blockage in the sewerage system. Larger items such as sanitary towels and tampons block sewage screens, pumps and pipes within sewage treatment works, reducing the flow and effectiveness of the system. This can result in sewage overflows onto our beaches and into our rivers through combined sewer overflows, or even into our homes and gardens as the system overloads. Water companies spend a lot of money and time unblocking the system, funds that could be better spent on improvements! The TBYF message is simple; the only things that should ever be flushed down a toilet are those that have passed through your own body and the paper you use to wipe your behind! Thank you to the Environment Agency for their support and Chris Betty for all his hard work on the project. Our coast and beaches are our greatest assets and ones that are truly treasured by 4 million visitors a year. Your help in reducing unwanted and unsightly sanitary waste on our beaches by promoting the ‘Think Before You Flush’ campaign is vital to our future success so please help us get the message through.